This book is about a violinist who finds on tour a masterpiece of an unknown composer. As soon as she gets back home in Boston and plays the first notes…strange things start to happen in her life. The music seems like magic. The music powers over people. The music goes on because she can’t stop playing until… The history of the World War II in Italy plays an important role and gives information I have not heard before. It is fiction, but I wonder if the name of a work camp or a concentration camp, is totally fictional. For reading it within two days, I have found no spelling or grammar mistakes. Brilliantly written is the story. Extreme professional style of the writer. It lets your mind think, think and think over again after every happening, change, travel and so on. The style of writing with the combination of the history lets me think about the Dutch author Simone van der Vlugt as well. The way she writes her historic novels. 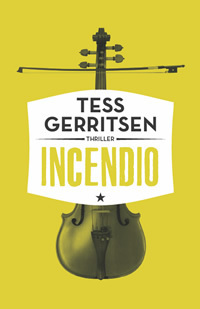 Though Tess Gerritsen writes moreover thrillers. The violinist is the woman Julia Ansdell lives with her husband Rob and their little toddler Lily in Boston. Every character in the book plays a little role except the one of Julia. After a while her best friend from the violin ensemble begins to play an important role and even her husband Rob plays a far more important role at the end than you could ever imagine at the beginning of the book. Enjoy reading this little book! And be prepared: it lets your head tumble!